Reverse I - The top flower is open with long, curved petals. The "1" in the date has a flat top. 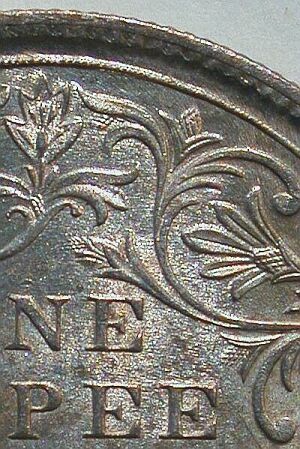 Reverse II - The top flower is closed. The "1" in the date has a slanted top. 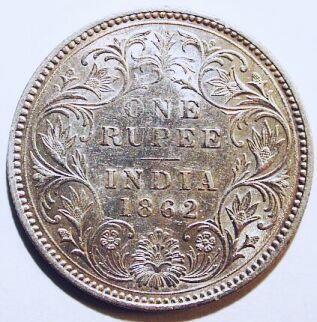 Reverse IIa - Variant of Type II on a few 1862 Rupees. 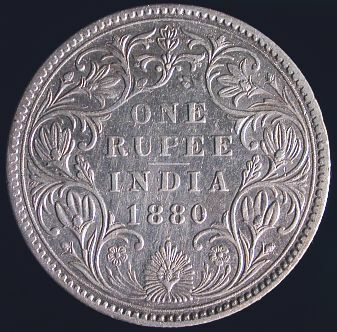 Similar to type II, but the flower buds above the "E" of "ONE" and above right of the second "E" of "RUPEE" have a pineapple-like pattern. Reverse III - The top flower is half open. 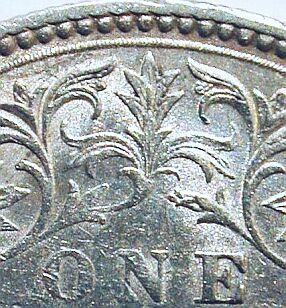 The "1" in the date (1862) has a flat top. Reverse IV - Variant of Type II reported by W.A.T. 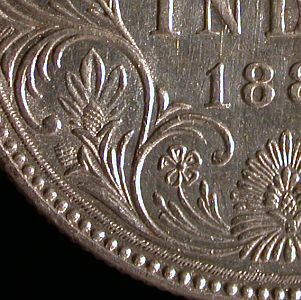 Aves in a Feb 1984 Seabys Coins and Metals Bulletin and confirmed by collector Bob Johnston. 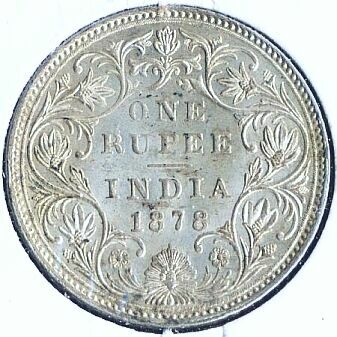 This reverse type is so far known to exist on the Bombay Rupees for the years 1879, 1880, 1881 and 1882. Reverse IV is slightly different in many areas but the most recognizable difference is in the lotus flower to left of the date. The type II flower has five petals, while the type IV has three larger petals. 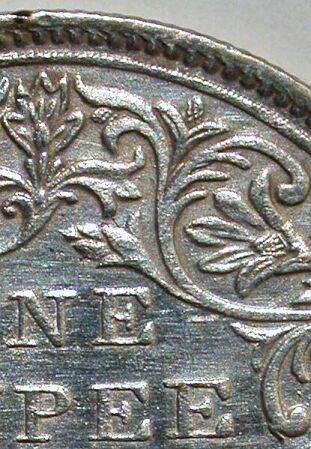 In 1862 there was a variant of Reverse Type II referred to as Type IIa. It is very similar to Type II. Identifying features are shown in the photos below. 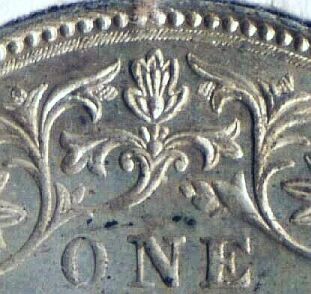 Two flowers have a "pineapple" appearance on the Type IIa. 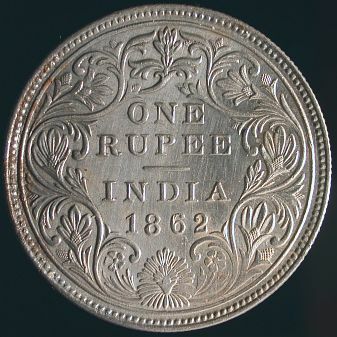 The easiest to identify is the flower just above and to the right of the last "E" in "RUPEE". Type II does not have a flower bud, while IIa shows a pineapple-like bud. 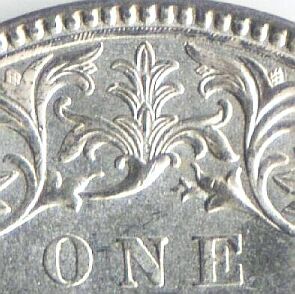 Also, a little above the "E" in "ONE" the flower bud appears pineapple-like on the Type IIa. 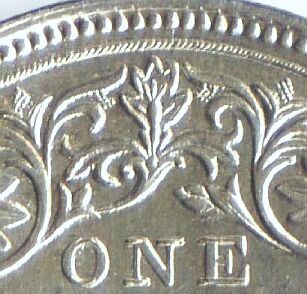 In 1879-1882 there was a variant of Reverse Type II referred to as Type IV. It is very similar to Type II but has numerous small differences. The most recognizable difference is in the lotus flower to left of the date. Type IV has three large petals, while type II has five smaller petals. 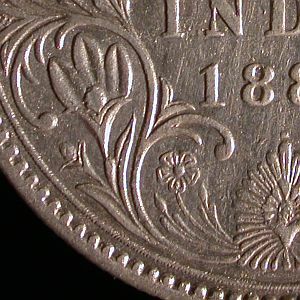 A full coin photo is shown above. 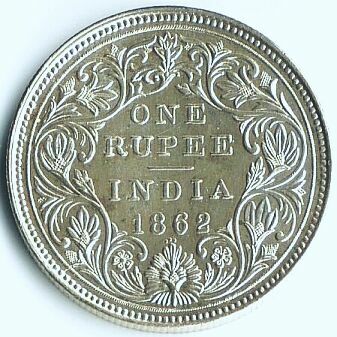 In 1862 there was another reverse variant called Reverse Type III. The top flower is very distinctive with pointed petals. 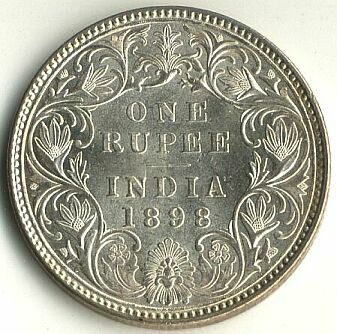 There are some variants of Reverse Type II. Below is an example.